The new Civic Hybrid you've wanted isn't called Civic. Honda is serious this time around about the Insight hybrid sedan. The first and models were good enough for their respective eras, but neither was particularly stylish or refined enough to go mainstream. Honda is hoping that’ll all change now that the has officially begun production in Indiana. The automaker’s announcement also declares a $61.5 million investment in not only the Greensburg, Indiana, production facility, but also in three Ohio plants that contribute to the Insight’s powertrain. The 2019 Insight is slated to arrive in Honda dealerships early this summer, slotting in nicely between the Civic and Accord. Actually, it’s based on the Civic, so consider it the Civic Hybrid that Honda doesn’t build. With a combined fuel economy of 55 mpg, three trims levels will be offered: LX, EX and Touring. Power comes from a 1.5-liter Atkinson-cycle gasoline engine that is built in Ohio. 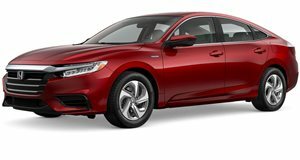 Its hybrid battery pack is assembled at a separate Ohio plant which also happens to produce the also new 2019 Accord Hybrid. Official 2019 Honda Insight pricing will be announced closer to the on sale date.